Blog #11is the final one for this tour! Sunday May 18 – Eutin, Germany. 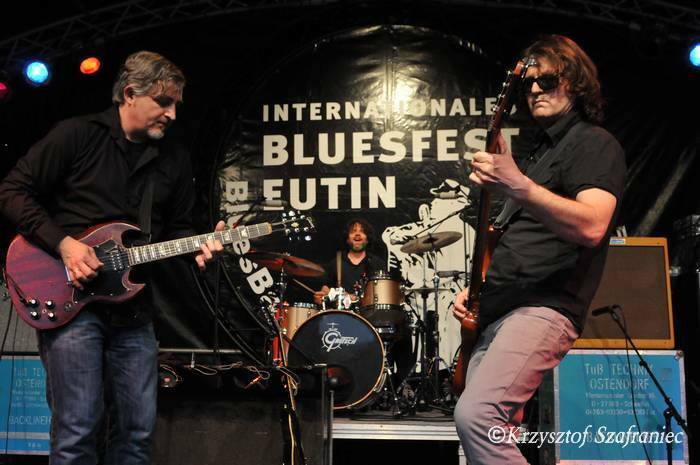 The 25th International Blues Baltica Festival at Eutin. The drive from Poland to Germany is wet. Our performance at tonight’s festival is at 7:30pm. It’s an outdoor event. If the rain doesn’t stop we may be playing to the soundmen and festival staff. We get to the festival and the rain is continuing but not too heavy. People are finding cover under beer garden tents and canopies. The music is in full swing when we get there and this place looks fun. Today’s line-up is blues with a more “rock” sound. We are headlining, so we plan to shake up the set to deliver high-energy tracks right away since the crowd is already warmed up from earlier sets. We are doing a line check when the rain stops. It is 7pm. We talk to festival organizers and ask if we can start asap in order to take advantage of the break in the weather. Everyone agrees and we begin to the surprise of the attendees at about 7:15pm, about 15 minutes before our set time. The crowd files in and we are immediately rocking the very groovy “Know I love you, baby.” I feel like we are sort of the greeters for the break in the weather. The sun even comes out briefly. Our crowd is probably not as big as it could have been – between the change in start time and the effects on attendance due to rain all day long – but there’s a group of people thoroughly into the music, with a number of people dancing in front of us stage right and a bunch of people mirroring our smiles and expressiveness. The music is the sunshine. We are probably the loudest act at this festival. I get the sense that some of the traditional-types around us are not keen on what we are delivering, but we get a slew of great comments and exaltations from excited fans. I am reminded of the old axiom that it’s better to generate a strong response – even if it is dislike – than no response at all. I get the sense that everyone there will remember us and that is fine by me. There’s enough positive feedback from this show as well as all the other shows on this tour to validate our sense that our odd, eclectic take on modernizing blues music from our perspective is fresh and different. We will keep doing what we do. Monday May 19 – Eutin, Germany. This is our last day of tour. We are sticking around the festival for the after-party and other related events. We have a variety of great interactions, musically and socially and I think we surprise some people. We play a low-volume yet high-energy show at the after-party, quite different from our performance on the big main stage the night before. I get some great feedback about people appreciating our dynamics and range musically. Additionally, I think people are surprised about our ability to converse about a variety of subjects – social justice & human rights issues, neurobiology, nutrition, etc. I suppose we are not your typical “blues” band. Again, we are more than ok with this. We get to spend time with some of the other talented performers from the festival, notably the artist-in-residence Shakura S’Aida of Toronto, as well as a final day with the Matysik family who were our tour agents and managers. It is a great way to wrap up the tour. The fact that our hotel had a pool and jacuzzi … well, that’s pretty obviously a huge perk. Audiences – pretty much all of them were great, but I have to say that 4 crowds especially stood out: a) The audience in Torun pretty much matched us in terms of energy and sweat and helped elevate our performance; b) & c) the audiences in Grodkow and Dobromiertz were about as appreciative as audiences can be. These were both the smallest towns we played (we basically played large community centers in both towns) and they really seemed to appreciate our music; and d) the people at the Biala Podlaska Festival were enthusiastic and incredibly responsive to what we put out there musically and socially (after the show). My previous blogs explained all of those crowds in greater detail. Beer – the Brewery connected to the Museum in Bratislava, Slovakia … at least that’s what the beer drinkers in the band said. I prefer sipping whiskey and we are not in Tennessee or Kentucky, so there’s no need for me to list a “best whiskey” for this tour. Accommodation – we got to stay in a couple of really nice places. The one in Krakow was 4-star and was centrally located so we could explore the city. The one in Eutin was pretty special: situated next to the Diek Sea it had a pool & jacuzzi and we had enough time there to actually enjoy the posh facilities. Pleasant Surprise – we were told that the eastern European roads were not good. Maybe just a couple of years ago they were in worse shape, but they’ve obviously made some improvements to highways in the last few years. Considering we traveled about 6000km (about 3500 miles – which is a lot for 3 weeks on the road in Europe), it was good fortune to have nice roads. Bizarre Cultural Experience – Either the late-night first aid intervention in Uhersky Brod, Czech Republic (see blog # 6) or interacting with Polish stoners at the very beginning of tour. Poland is not marijuana friendly and since we are from Seattle – a city that has recently become a trail-blazer in American culture for de-criminalizing marijuana – we are used to dealing with stoners in public. That is not the case in Poland. I think they really liked the way we normalized their behavior. Audience – There weren’t any bad ones.